I’m not a big fan of football. I’m in it for the funny commercials and commercials with animals, but if there’s one thing I count on football games for, it’s great food! I can put aside my disinterest in who wins if there are great snacks. And while I know most of use can’t go to the big game this weekend to tailgate, it’s the perfect opportunity to show off for your friends and family with a backyard tailgate. We have some fantastic recipes on Weber Nation for chicken wings and grilled nachos but I don’t want you to forget about your favorite game-day treats just because you move the cooking outside. Your favorites buffalo chicken dip? Grill up the chicken before you pull it, and then bake it on the grill rather than in the oven. Grill your taco dip outside, make some quesadillas, or grill up flatbreads or flatbread pizzas. And speaking of pizza, there’s nothing better than pizza on the grill. 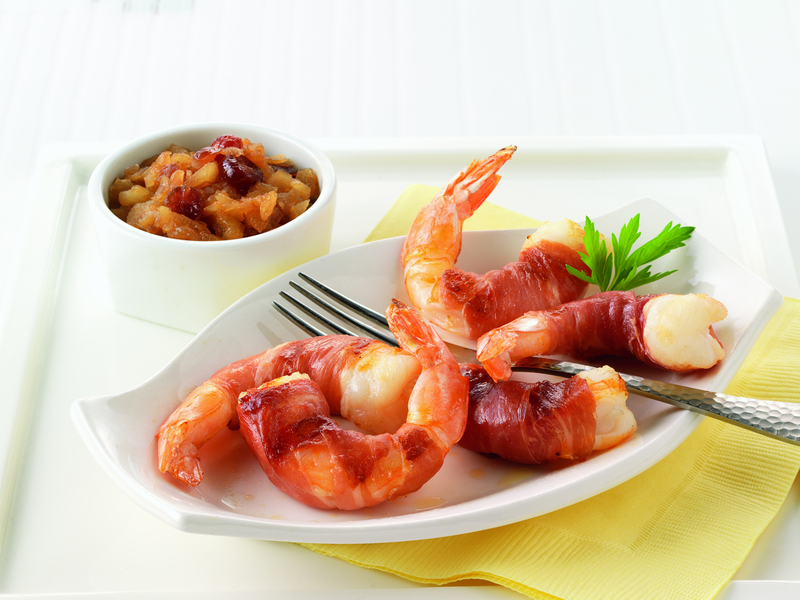 If you want to wow your guests, try our recipe for Prosciutto-Wrapped Shrimp with Pear Chutney in our Time to Grill cookbook. The chutney is delicious – have you ever eaten grilled pears? You can’t go wrong! And you can make the chutney on Saturday or Sunday morning before the party starts so you can enjoy being with your guests. Just store it in the fridge and take it out about 20 minutes before you grill your shrimp to take the chill off. Prosciutto-wrapped shrimp is similar to bacon-wrapped shrimp. When you buy your prosciutto, it’s important to make sure that it’s sliced very thin. Thicker slices are more difficult to wrap, and they are less willing to stay wrapped while you move on to another shrimp. You can purchase prosciutto from most deli counters or pre-packaged. In my experience, the pre-packaged prosciutto slices are usually thin enough for wrapping. If you still struggle to keep the prosciutto under control, use toothpicks to keep the shrimp wrapped while you’re preparing the rest of the shrimp, but remove the toothpicks as you place each on the grill. The heat will be too intense and the toothpicks could burn up. The shrimp will only take up to 4 minutes to cook. Get them on, get them off, and get back to the game. 2. Peel the pears, cut them into quarters, core them, and lightly brush all sides with oil. 3. Brush the cooking grates clean. Grill the pears over direct medium heat, with the lid closed as much as possible, until crisp-tender, 8 to 10 minutes, turning once or twice. Remove from the grill and, when cool enough to handle, put them in a food processor and pulse about 10 times (or cut them into a small dice). In a medium saucepan over medium heat, combine the pears and the rest of the chutney ingredients. Cook until slightly thickened, 20 to 30 minutes, stirring occasionally. Cool to room temperature. 4. Increase the temperature of the grill to high heat (450° to 550°F). 5. Cut the prosciutto slices in half lengthwise. Starting at one end, lay the shrimp on the prosciutto and roll the prosciutto around the shrimp. Lightly brush with oil. 6. Grill the shrimp over direct high heat, with the lid closed as much as possible, until lightly charred, firm to the touch, and just turning opaque in the center, 2 to 4 minutes. Remove from the grill and serve warm with the chutney. ©2011 Weber-Stephen Products LLC. Recipe from Weber’s Time To Grill™ by Jamie Purviance. Used with permission.